BREC's Woodstock Park. Photo courtesy of Google Maps. In an effort to fund its new Airline Highway Community Park, BREC has OK’d selling two of its vacant Baton Rouge properties for a combined $4 million. 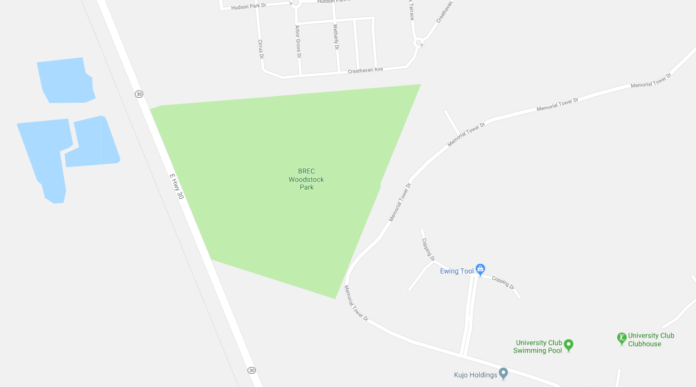 The agency on Thursday authorized selling for $3.6 million the vacant BREC Woodstock Park, a 53-acre tract with Woodstock Plantation that fronts Nicholson Drive, near The University Club. It also approved the $400,000 sale of 2.3 vacant acres within the Lafitte Hills subdivision, off Highland Road. The properties were among 23 identified as “obsolete” in a BREC study that has been ongoing since 2014, says BREC spokeswoman Cheryl Michelet, noting the agency has repurposed four properties since then and will sell three more in the near future. Once the two properties are sold, the $4 million will pay for the first phase of redevelopment for Airline Highway Park, which BREC selected as the site of its next community park shortly after voting to keep the Baton Rouge Zoo in its current location. The land for a BREC Lafitte Hill Park was donated to BREC years ago, Michelet says, but there wasn’t much public support to put a community park there and the plans never moved forward. The donors are aware and are fine with the fact that the money used from the land sale will go toward another property, she adds. Meanwhile, the 53 acres in Woodstock Plantation, sold to BREC years ago, are currently being leased for farmland. Developers have already expressed interest in buying the property, Michelet says. BREC must hold a public comment period and then open up a bidding process. By law, the properties must be sold at or above the appraised prices. Both ordinances would become effective on March 10. Any opposition received during the 15-day notice period of Feb. 6-20 will be heard at a public hearing held during BREC’s next meeting on Feb. 28 at 6201 Florida Boulevard.